These days, many executives find that a job search is not only difficult to conduct but a lengthy, time-involved process. As time draws on, they may even find themselves in an unproductive, stagnant job search. Or, perhaps they are landing interviews, but for some reason, not sealing the deal with a job offer. Being caught in a stalled job search is not only discouraging, disheartening and difficult — it’s costly too. For every multiple of $100,000 in salary, being unemployed for a month can cost a person $8,000 in salary. But it doesn’t have to be that way. In fact, I’ve been able to help 10 out of the last 14 executives I’ve worked with land a job within four weeks — and that includes those with a previously stagnant search that had been dragging on for over six months. The number one way to accelerate an executive job search is to define and articulate your brand, then communicate it on your resume, LinkedIn profile and during the interview. In other words, you are a product. You need to distinguish yourself from others and define your “unique selling proposition,” so you can easily communicate and market your strengths. Defining your brand allows you to sell yourself to others. • What adjectives describe me? • Why have others hired me for previous jobs? • What benefits do I bring to an employer? • What do I do better than anyone else? • What accolades have I received? • What impression do I make on people when they first meet me? • What challenges have I solved for employers? Take some time to think about and journal these questions, going into great detail about your strengths, accomplishments, and personality. Then, use this information to determine what it is you do better than others, how you do it, and why someone should hire you. This is known as your “USP” or your unique selling proposition: what will sell you to prospective employers. Many find that they are unable to articulate their brand by themselves. Some find that they are too humble, and others say they were taught not to toot their own horn and thinking highly of themselves doesn’t come naturally. If need be, a professional career coach or resume writer can help. Once you define your brand, you’ll want it to permeate your resume. A boring resume reads like a history of what you’ve done, whereas a branded resume is a sales and marketing document that sells you for your ideal position. A branded resume, written correctly, should be sufficiently captivating to the point where recruiters and hiring managers want to pick up the phone and call you in for an interview. The top summary section should nail your brand and communicate why you’re the ideal candidate for the position. For each job description on the resume, the challenge you were brought in to solve should be described, and the accomplishments or “bullets” for each position will share the accomplishments you achieved in that position. If your LinkedIn profile is properly optimized, it will draw recruiters and hiring managers to your profile page, especially if you achieve “all-star” status, have the proper headline, and make proper use of keywords. Once you draw in recruiters and hiring managers to your page, being able to share your brand is what will captivate them and entice them to reach out to you. The best place to share your brand on your LinkedIn profile is in the summary section. Lead with a one-sentence summary statement for your brand, then share more about what makes you unique and why the recruiter or hiring manager must reach out to you. I’ve found that becoming clear about your brand will help to accelerate even stagnant job searches. Identify your strengths and your unique selling proposition, communicate through your resume and LinkedIn, and you’ll find you’re suddenly landing job interviews — and ultimately, job offers. Need help accelerating your Executive Job Search? You’re not alone – most find it difficult to articulate their brand. An outside expert can help. 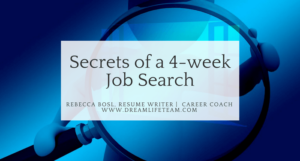 Rebecca Bosl is a Career Strategist and Executive Resume Writer at www.dreamlifeteam.com – Stunning, top-tier Executive resumes that land job offers in as little as 4 weeks!